but without the one-person loading feature. and for recumbent tandems too! Handle disc brakes and Low Rider pannier racks with ease. Feature a full length wheel tray and infinitely adjustable wheel strap. 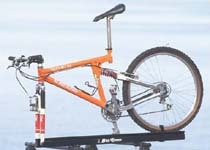 Mount to Yakima (round) & Thule (rectangular) compatible load bars with included hardware. Mounting kits are also available for Thule Rapid Aero and OEM load bars from VW, Audi, Mercedes, BMW and Mini. Are compatible with our Topper Lok 9mm Security Skewer - the ultimate in locking skewer systems. Are a breeze to install / No assembly required. 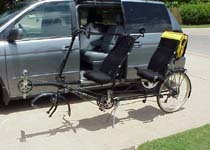 High quality carriage for most tandems and LWB recumbents, including the Rans Screamer recumbent tandem. Carries a single bike too without need for adjustment. Features a quick disconnect removable tail section and needs a mere 22" load bar spacing. Longer brother to the BT-76. Handles extra long tandems and recumbent tandems like the Rans Seavo and ATP Double Vision. Also carries a single without adjustment, has a quick-disconnect removable tail section. Needs only 22" load bar spacing. The only purpose-built roof rack for bikes bigger than a single but smaller than a tandem. Carries CWB recumbents, longer-wheelbase cruisers and crank-forward bikes up to 63" wheelbase (will carry a single too). Requires only 15" load bar spacing. The 'High Topper' was originally designed for a randonneuring friend needing extra clearance for low front fenders and pannier racks. It will do the same for you - and you don't have to ride 600km to need one! Needs only 20" load bar spacing. 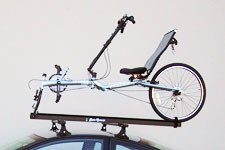 Designed to carry singles and SWB recumbents on cars with very short rooflines. Atoc's unique Fork Forward design balances your bike across load bars spaced as little as 12" apart. Beefier and stronger than your typical basic single bike rack.